One of the extraordinary sunrises on Australian East Coast. A vivid sunrise lights the morning sky above Terrigal on NSW Central Coast. This breathtaking scenery is just one of the elements that attracts visitors and tourists to this area of NSW for holidays and vacations. Watching a sunrise can be a peaceful and self-reflecting experience. Many couples like to watch sunrises together as they are often considered a romantic occurrence and have a magical element to them. Depending on the temperature that day and the clouds in the sky, a sunrise can truly light up the sky with brilliant colours. This sunset has turned the sky shades of reds, yellows, oranges, pinks and purples. This image belongs to the travel and nature stock photo library. This stock photo of Dramatic Sunrise at Terrigal is available for licensing for commercial and editorial uses including websites, blogs, books, magazines, brochures and advertising. Restrictions may apply for images which contain third party copyrighted material or sensitive subjects. Photos of artwork are for editorial use only. 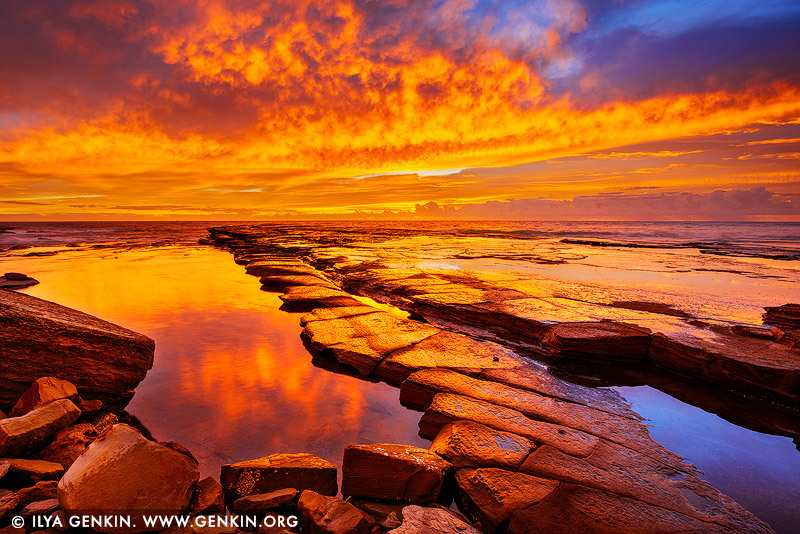 This image id AU-TERRIGAL-0001 of Dramatic Sunrise at Terrigal, is copyrighted © by Ilya Genkin. This is not a public domain image.